Address: 115 E. Tropicana Ave. Restaurants : Hooters, Dan Marino's, The Dam Restaurant The Bait Shoppe and Pete and Shorty's Book and Bar. 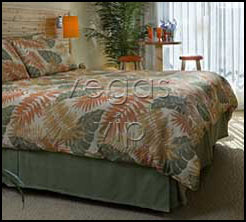 Standard room amenities : Cable TV, hair dryer, desk, electronic door locks, iron, in-room safe, telephone with voice mail. Hotel amenities : luggage service, maid service, VIP services, safety deposit box. 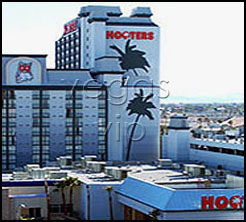 The first-ever Hooters Casino Hotel is a tropical-themed resort, resembling something of a Floridian oasis. Expect beautiful employees, clad in the ever-popular orange shorts and white tank tops and a fun atmosphere. Guests can enjoy dining at a variety of new restaurants including Hooters, of course, featuring the famous Hooters girls, and The Bait Shoppe, a sushi bar and gourmet restaurant. 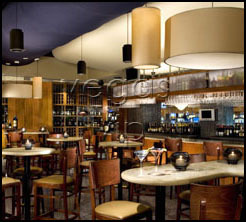 The hotel also offers the award-winning Dan Marino's Fine Food and Spirits, from the former Miami Dolphins quarterback. The property's pool area features beach sand, palm trees, a lagoon waterfall, cabanas and the Nippers Pool Bar. Other bars and clubs at the Hooters Casino Hotel include the Dam Restaurant 13 Martini Bar, Porch Dogs and Pete & Shorty's Book and Bar.